The Type Flap Hydraulic Press is manufactured in window frame design and is highly demanded in the industry for its dependability. These hydraulic presses give high production at minimum time and lesser cost. 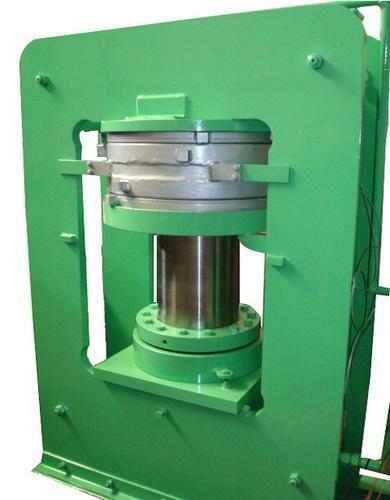 The range is ideal for producing Type Flap Hydraulic Press of all Sizes. All presses are supplied with complete Hydraulic Power pack unit in compact design including electrical control Panel. We offers Hydraulic Press to our clients. Electric push button controlled with Inch Auto Cycle and Multi Degassing system. Press Frame : Family Fabricated out of IS: 2062 M.S. Prime plate tested material adequately reinforced to take full load. Cylinder : Cylinders made out of Solid Steel Forging material ultrasonically tested. Mode of Heating : Steam or Thermic fluid heating system. Ram : Alloy Chilled cast iron ram mirror finished polished, duly grinded. Hydraulic Power Pack : Yuken / polyhedron make Hydraulic Power Pack. Type Frame Type, made of prime plate tested material. Mould Fabricated out of tested mild steel plate, shape of mould according to the choice of customer. Mode of Heating Steam / Thermic Fluid. Capacity 150 / 180 Tons. Cylinders EN-8 Forging Tested Material. Space Required 4 feet x 7 feet approx. Uttam Rubtech Machinery (P) Ltd has always been competitive manufacturer to take initiative to serve the esteemed clients with latest rubber processing machines manufactured with sophisticated technology. Incepted in 1958, our company has strengthened its share in India as well as overseas markets by prudently using its resources, ethical business policy and aggressive marketing strategies. With professional excellence and business acumen, we aim to achieve and hold the position of leaders by developing highly inventive and functional technologies indigenously. Our firm never relishes on past laurels and awards and constantly moves forward to the limits ahead of the imagination to guarantee customer delight – each time and every time. Further, we look forward for achieving the desired objectives by empowering advanced technologies, employing compatible human resources, building brand imaging and enduring in the state of customer obsession. Precisely, we vouch to meet the variegated needs of the clients by benchmarking quality and customer services.